Here at QS Labs we’ve been curious about the differences between two of the most popular devices among self-trackers: The Nike+ FuelBand and the FitBit. I’m the latest experimenter on this topic, and since January I’ve been wearing a FuelBand on my left wrist and a FitBit (original model) in the right hand coin pocket of my jeans. The FitBit almost always counts significantly more steps than the FuelBand. The details are interesting. When Bastian compared his FuelBand vs his Fitbit, he found a slight correlation between his activity level and the difference in the number of steps they counted. In other words, them more active he was, the more the two devices disagreed. When Ernesto did his FuelBand vs Fitbit test, his numbers closely matched. My data is more like Bastian’s, but with the effect of high activity even clearer. Look at the graph below. On the vertical axis is the difference in step count, by day. On the horizontal access is the number of daily steps Fitbit counted. 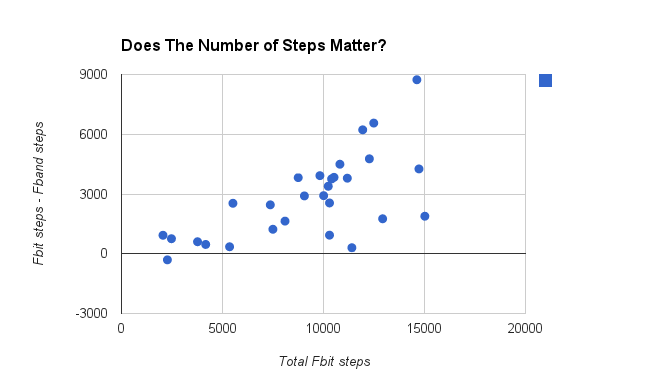 The higher the number of “FitBit steps,” the more likely it is that “Fuelband steps” are much lower. I have a different theory. When I’m at home, I work standing up. The very high step count days are often days when I’ve worked at my desk. Comparing two specific days shows the effect of time at my standing desk on my activity data. DATE      FBand Fitbit Dif. %Dif. On February 28, I flew to San Diego, walked around the UC campus, and toured a lab. On March 4 – yesterday – I was at home. For most of the daylight hours, I stood and worked. Standing so much increases my step count, and leaves the FuelBand behind. Is this a problem? Maybe not. The FuelBand reliably captures intentional steps, which it interprets as exercise. The FitBit gets these, but also registers more ambiguous movements, which in its framework count as activity. The Fuelband is made by a fitness company. The FitBit is for general lifestyle use. Technically, what is probably happening is that the Fuelband is deliberately dampening the signal from general bodily movement, in service to its goal of registering exercise. Which approach you prefer will depend on your own mental framework. However, there is one way in which I find the Fitbit much superior to the Fuelband, though far from perfect. In order to do this simple analysis, I had to get my activity data into a spreadsheet. This is possible with the Fitbit, if you purchase the premium service for $50 per year or use the Google Spreadsheet hack we’ve demonstrated. The Nike+ FuelBand doesn’t permit users to export data, so I had to copy these numbers over on to my spreadsheet one day at a time. That’s a big barrier to a modest experiment.